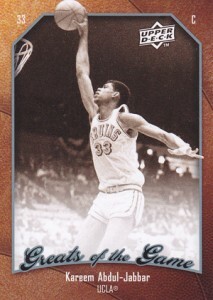 The Kareem Abdul-Jabbar v. Upper Deck trial, previously set to take place last year, will finally begin on March 12th. The trial is over whether Upper Deck needed Abdul-Jabbar's permission to use pictures of him from his time with the UCLA Bruins in 2009-10 Upper Deck Greats of the Game. This case is important because it will help define the boundaries of when card manufacturers need to obtain permission from players before using their likenesses on cards. Given that a court recently held that Topps could use images of Buzz Aldrin in 2010 Topps American Heritage: American Heroes Edition without his permission, a lot of industry eyes are on this case. A win here for Upper Deck opens a lot of opportunities for card companies to print cards, while a win for Abdul-Jabbar could cost card companies more in licensing fees to use players' images. It looks like a final status conference and a mandatory settlement conference will take place before trial on March 2nd. However, given how long this case has dragged on, I don't expect it to settle. It's been reported that Bill Walton may be a witness for Upper Deck. I guess that gives new meaning to Abdul-Jabbar's quote from Airplane, "The hell I don't! LISTEN KID! I've been hearing that crap ever since I was at UCLA. I'm out there busting my buns every night. Tell your old man to drag Walton and Lanier up and down the court for 48 minutes." OK, it doesn't completely fit, but how could I resist with "court" and "Walton" in the same quote? Also a media request to “photograph, record, or broadcast" the trial has been denied by the court. Legal translation: If you want to follow the trial on TV, you're going to be stuck looking at hand-drawn pictures. Maybe the artist can get Kareem to autograph them after or sign on as an Upper Deck sketch card artist. 2007-08 Upper Deck Fleer Ultra Autographics Kareem Abdul-Jabbar Auto Very Rare!